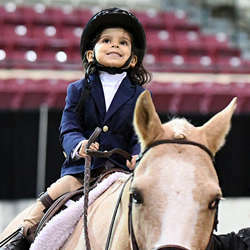 The 2019 WIHS Regional Horse Show & USHJA Zone 3 Championship, presented by The Bishop Family, will be held Oct. 18-20 at Prince George's Equestrian Center in Upper Marlboro, MD. 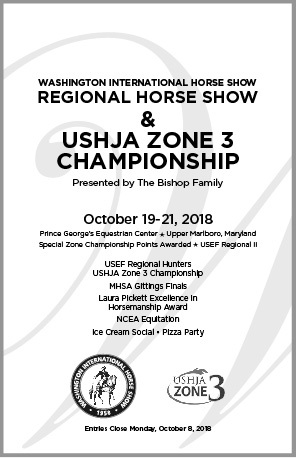 The USHJA Zone 3 Championship will take place on Sunday, Oct. 20. > Online entries will be accepted on Horseshowing.com. > Zone 3 Championship accepted riders will be listed on Horseshowing.com in September. Introduced in 2012 in memory of Laura Pickett, a very special local equestrian and trainer, the award will be presented to an up-and-coming adult or child rider and their trainer competing at the WIHS Regional Horse Show & USHJA Zone 3 Championship, who best exhibit the enthusiasm, dedication, style and commitment to excellence in horsemanship that brings out the best in horse and rider. The Laura Pickett Excellence in Horsemanship Award is presented by Vicki Lowell and Charles Ancona. Nominees are designated by wearing a pink armband and are judged both in and out of the show ring. The winner is chosen by committee and is notified Sunday. 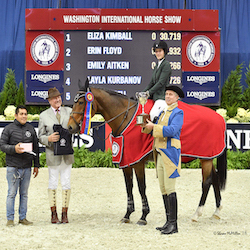 The winner and family are invited to attend WIHS at Capital One Arena on Thursday night for the presentation held during Barn Night. The winner will receive a show jacket courtesy of Charles Ancona. Nomination forms will be available in July. 2019 Prize List for WIHS Regional Horse Show & USHJA Zone 3 Championship will be posted in September. Hotels: Book your hotel through Equestrian Travel (available in May). Contact Equestrian Travel at 855-464-2556. Mon– Fri, 6am–5pm (PST).